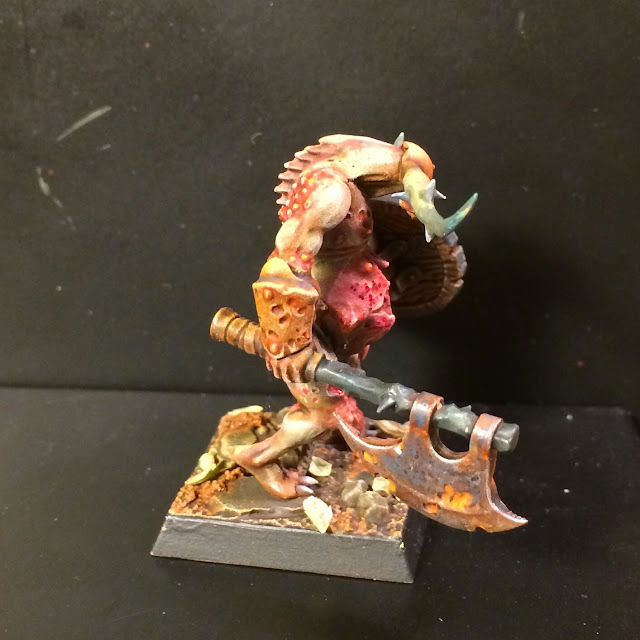 Covered in pustules and with infected flesh sloughing from him, the first diseased member of Gloops retuine shambels forward. This was one of those minis that felt like a complete disaster halfway through the painting process, but turned out okay in the end. Really like the proportions on this one. Great kitbash and paintjob! If it's one thing I could set my finger on is that the base blends to much with the mini. I don't know if that's intentional but it kinda drowns the overall composition. Bah never mind me, it's awesome. You´ve certainly got a point about the base. Disaster?! Why?! He's just perfect! I said it felt like a "disaster halfway through". That doesn´t mean it turned out a disaster - I´m quite pleased with it. That's a really cool take on the nurgle symbol on his shield. Very reminiscent of the way the "Eavy Metal" team used to paint them up in the old Realm of Chaos books. Yeah - I was going for an old school look. 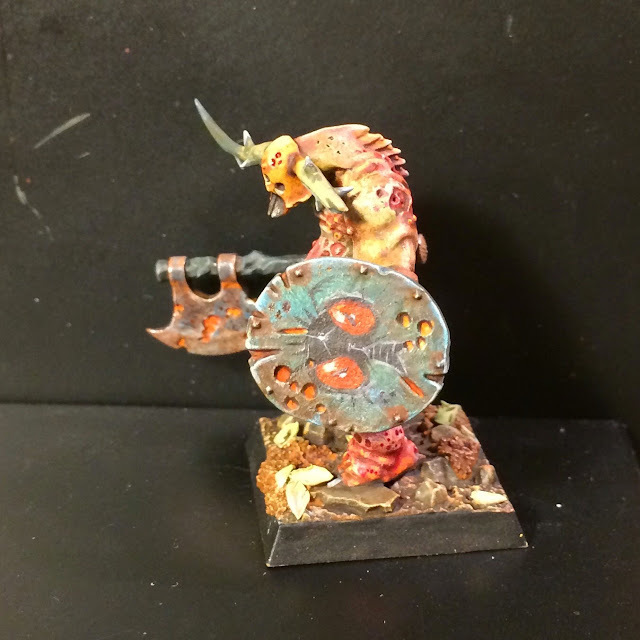 This whole warband will more or less be a tribute to the Lost and the Damned of yesteryear. I think you might be right there... Thanks for the input! Finally feeling inspired enough to get back to working on some of my own Nurgle stuff. Could see a crow landing on his antlers as a cheeky passenger. Ha! Yeah - a crow or a mangy buzzard or something. Or a big giant nurgly fly. 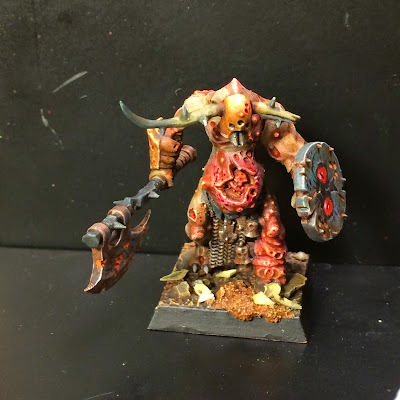 Great looking model. The helm fits so well with the rest. And love the shield and the fly-symbol! 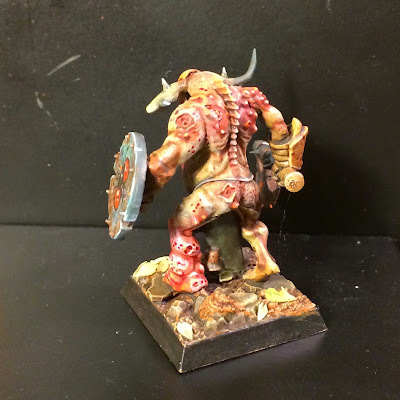 As for suggestions on more members in the warband I'd love to see your take on a Nurgle Centaur. There's actually already pkans for a nurgly centaur... Stay tuned!